Today Google announced a nice customer friendly billing change to its Project Fi MVNO. Called "Bill Protection" it caps data charges at $60 per month. Project Fi costs $20/month for unlimited talk and messaging plus $10 per GB for data. Starting today, single line Project Fi customers will never pay more than $80/month even if they use more than 6 GB of data. As before, customers who use less than 6 GB in a month will receive a prorated account credit for unused partial GBs of data. Single line customers who use more than 15 GB of data will see their speeds reduced to 256 kbps for the rest of the month. Users who need more than 15 GB of high speed data can still purchase it for $10/GB. The capped data price for multi-line plans is higher; $100 for two lines, $120 for Three lines, $140 for four lines, $160 for five lines and $180 for six lines. There's also a $15/month line charge for each additional line after the first. Project Fi operates on a combination of the Sprint, T-Mobile and US Cellular networks. WiFi calling and messaging is also available. Project Fi phones will automatically switch between the three networks and WiFi as needed. Hotspot is included at no extra cost. International data roaming in 135 countries is available at the same prorated $10/GB. Bill Protection applies to international use too. Texts are free while roaming internationally and calls are 20¢/minute. Project Fi requires special software to accomplish its network switching magic. A supported phone is required. Currently the Pixel 2, Pixel 2 XL, Pixel, Pixel XL, Android One Moto X4, Nexus 6P, Nexus 5X, and Nexus 6 are supported. In addition to launching Bill Protection, Google put two of its phones on sale today. For a limited time, the Android One Moto X4 is $299 (reg $399) and the Pixel XL is $549 (reg $669). Doesn't seem to be competitive for those of us that need US only use and sprint and tmo coverage jsut don't cut it for some of us. It is not really competitive at all! I think I will stay with MetroPCS. I like the 50.00 price point a whole lot more. And you're stuck on a single, small network. Cause the Sprint network is so large, as for US cellular, unless you are in the middle of the country, or the hills of California, no one even heard of them. "Cause the Sprint network is so large"
That's the first time I've heard anyone describe it as such. You must be on Bug Tussel? Hi Dennis, small correction reqd in the last para - Pixel2 , Pixel2 XL mentioned twice. Google Fi is a bit like Google Fiber, a pet project of Google aimed at shaking up the status quo, but never fully formed into a bona fide competitor. Its pricing hasn't changed in its start in 2015, and is no longer competitive, even when compared against the Big 4. Its pricing scheme--pay for what you use--is also obsoleted, because smartphone use nowaday is increasingly about data, and people don't care about fractions of a GB as much as how many GBs they can get for a given dollar amount. 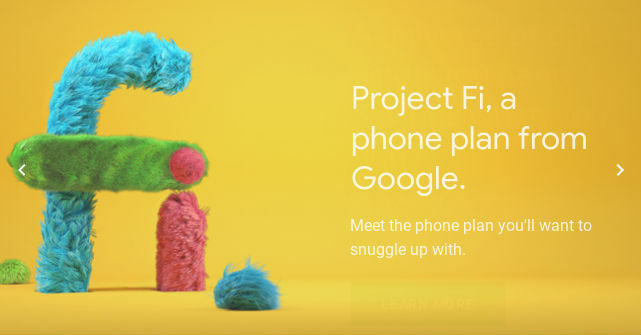 But the main reason why Fi remains a pet project is that it makes no attempt to go mainstream with some budget phones. In fact it has gotten worse, with the lowest a $400 phone (temp discount to $300). OTOH its coverage (TMO + Sprint + USCC) is fine. With TMO ramping up its 600MHz that will rival VZW in a year or two, Fi will have the best coverage in the country. The more pertinent question, given that both of these remain pet projects, is how long they will be around. I don't imagine Google makes much if any money from these ventures, and they are a drag on the company's core competencies. At some point, they'll need to be divested, either spun off, or be sold to another provider. The real announcement would be opening up 'any' smartphone to come and join Project Fi, until then Google is an 'also ran'. The current mobile market has become very competitive, here some credit is due to Google's Project Fi. When Google introduced Project Fi, it said that it wants to show what tech advances can be made in electronic communications. Now, it appears it has become too big to be nimble when it emerged in to the market. Fi never mattered because they never tried to be competitive. They should concentrate on Fixed Wireless and Google Fiber. Forget Fi. 15GB is not unlimited, that's a bucket plan with a speed reduction. Same bucket plan Verizon/ATT have offered for years that everyone hates. This is still a very poor value proposition unless you NEED international data. But it is unlimited. You can consume as much data as you want. Reduced speed means the carrier is actively limiting the data you can consume, and limited data is by definition NOT unlimited.